Tom Douglas is like a big, friendly, rumpled bear of a man, impossible to ignore, impossible to dislike. He has kind words for everyone, including his competitors in the restaurant business. Leslie Mackie, on the other hand, is almost elfin in stature, with good humor and grace, creativity and resolve. This season, they've both got fine books about baking. As a young baker from Portland, Mackie got her start at Gwen Caldwell Bassetti's Grand Central Bakery. 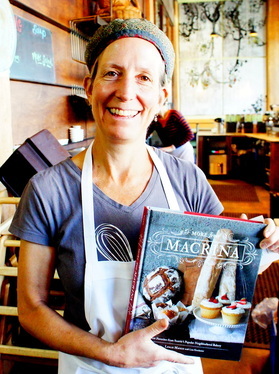 She started Macrina, in Belltown 20 years ago, and her second cookbook, "More From Macrina," has now come out. Among the changes since the first volume was published: Mackie turned over control of the company to the local foursome that owns Pagliacci Pizza and DiLaurenti's, and moved into a new production facility in a century-old building in SoDo. The best part of the book is its lack of pretension. Want bread with deeper flavors? Roast your seeds and nuts. Want to keep your cupcakes firm, yet moist? Mackie suggests Xantham gum, an ingredient (made from fermented corn syrup) that most cookbooks are afraid to mention, let alone recommend. Want an artisan bread you can make without kneading the dough? Mackie tweaks the famous New York Times recipe from 2006 by adding ½ cup of rye flour. 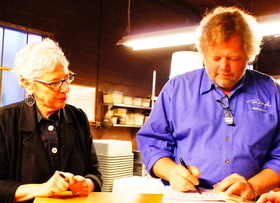 "Leslie Mackie is the goddess of bakers in Seattle," says none other than Tom Douglas. The Douglas saga is well-documented. Since his first restaurant, Dahlia Lounge, opened on Fourth Avenue in 1989, he has created a local restaurant empire with a dozen restaurants and nearly 1,000 employees. His first cookbook, "Tom Douglas's Seattle Kitchen," won the James Beard Award in 2001, and earlier this year, Douglas won the James Beard Award as America's best restaurateur. At this point in his culinary career, T-Doug (as everyone calls him) realizes that his strength does not lie in the day-to-day business of operating a restaurant or a bakery. He has a trusted operating partner in Eric Tanaka, and a down-to-earth ceo in Pamela Hinckley. And even as his company prepares for a huge expansion through the South Lake Union neighborhood, Douglas and longtime collaborator Shelley Lance have published "The Dahlia Bakery Cookbook." Inside the covers are 125 recipes, from a triple coconut cream pie to a doughnut with cinnamon sugar and marscapone that Food Network star Giada di Laurentiis has called the "best thing I ever ate." T-Doug admits he's not a baker. "Bakers are crazy, bakers are irrational, bakers are perfectionists..." he writes. Cooks, on the other hand, are "a scrappy lot." But over the past quarter century, the line between fine dining, casual café and down-home bakery has blurred tremendously. His Dahlia Workshop, where the goods for the Dahlia Bakery are produced, is a compact factory, turning out an assortment of muffins, doughnuts and breads. Delightful anecdotes fill the pages, none more touching than the story of T-Doug's parents saving up for a full year to afford a 1954 Wedgewood gas range. Good advice as well: don't skimp on equipment. It wouldn't be Seattle if there were not also an earnest, unadorned vegetarian cookbook to put all those passive-aggressive diners and self-centered fusspots to shame. This is where Michael Natkin comes in. His blog, Herbivoracious.com, may be a tongue-twister, but he comes by his enthusiasm honestly: he quit his software job at Adobe after 12 years to concentrate on cooking and photography, but not before he spent months working in professional kitchens. And how can a reader resist a Spanish lentil and mushroom stew? It's not all tofu: pappardelle with eggplant ragu and fresh ricotta comes right from the Old Country. Natkin celebrates the "golden age" of readily available organic produce and ethnic ingredients: Mexican, Indian, Korean, Middle Eastern. Not to mention World Spice Merchants in the Pike Place Market, and Chef Shop in Interbay. 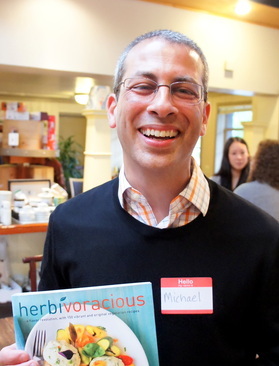 And, as befits a book by a blogger, "Herbivoracious" is also available in an "enhanced e-book edition," with two dozen videos featuring Natkin touring ethnic markets, introducing ingredients and showing how to choose them, and preparing recipes from the book. The e-book will also offer social media functionality for sharing recipes, photos, and video on Facebook, Twitter, and blogs. Let me append to these culinary tomes a couple of non-traditional food books that also tell important stories about the Northwest. First is Marsha Glazière's coffee book for and about our coffee-crazy region. We wrote about this lovely book earlier this month. You want something more glamorous than a coffee shop? How about a yacht! Marianne Gardner, who hails from Salmon Arm, BC (in the northern reaches of the Okanagan Valley, between Kamploops and Revelstoke) has found an unusual occupation for someone so landlocked: she's a private chef for owners of luxury yachts. Armed with little more than boundless enthusiasm and a dog-eared copy of the Rombauers' "Joy of Cooking," Gardner divides her book not by courses or ingredients but by the vessels whose galleys she has filled with freshly-baked breakfast rolls, buffet lunches, and multi-course dinners. Her tone is anything but gossipy; she finds some of her employers' galleys a bit cramped. After several years at sea she and her husband eventually buy their own 39-footer and sail from Florida to the Azores. For the last decade she's only worked on motorized yachts, from a base in the Bahamas, while maintaining a seasonal catering business in Salmon Arm. And finally. a bit of nostalgia, looking back at the 1970s and 1980s, when "Washington Wine" was considered an oxymoron. 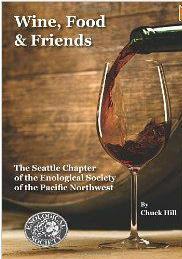 The Seattle Wine Society, which dissolved this summer, has published a memorial monograph titled "Wine, Food & Friends." It comes in at 108 pages, listing all the judges for its competitions, award-winning wines over the years, along with vintage photos and menus of its regional dinners. Finally, then, in the spirit of regional magnanimity, how about "Gastropolis," by Portland restaurant writer Karen Brooks? This is the ultimate foodie book, and it's only a matter of time until one of our local scribes compiles a Seattle version. Full title: "The Mighty Gastropolis: Portland: A Journey Through the Center of America's New Food Revolution." Portland's celebrity chefs are profiled (Gabriel Rucker of Le Pigeonn, Matt Lightner of Castagna), along with recipes and juicy gossip. Andy Ricker of Pok Pok is heralded as a hawker (of street food) for a new generation. Naomi Pomeroy's pop-up, Beast, comes in for a back-handed compliment ("meat-slinging bad girl"). Portland's food-cart culture gets lavish praise, as do practitioners of small-batch coffee roasting and other culinary artisans. Detailed recipes and lovely photographs by the author and her colleague Gordon Bosker. Next year, Seattle! Menus & Memoirs of a Yacht Chef, online at www.menusandmemoirs.com, $29.95. This page contains a single entry by Cornichon published on December 21, 2012 9:00 AM. Why does Snohomish County hate horsemeat? was the previous entry in this blog. Meet your new dinner: Aquadvantage Salmon is the next entry in this blog.